lol - i wonder if Eric Carle got paid twice for this design considering all he did was change the Autumn colours for Spring colours in two letters. 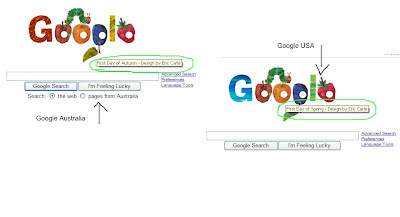 Oh btw Google - someone get a clue - Australia changes it's season on the first of the month... Not mid-month like you do in the USA. For an 'information' company it's a pretty dumb mistake.